I can't seem to keep them very long at all, and it's driving me nuts!! Well, I will make do with what I have!! Anyway, back to nails...please to ignore the dry cuticles, I forgot lotion!! I started with a lovely, slimming neutral color. Essie San Tropez is so pretty!! Stamped on some what I originally thought was bamboo...It's not. Looks kinda like crackle. Eh. 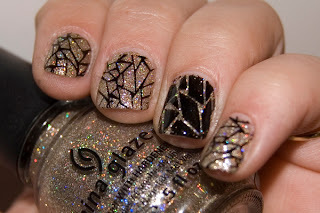 China Glaze Street Chic. Topped it all off with some China Glaze Fast Track!!! 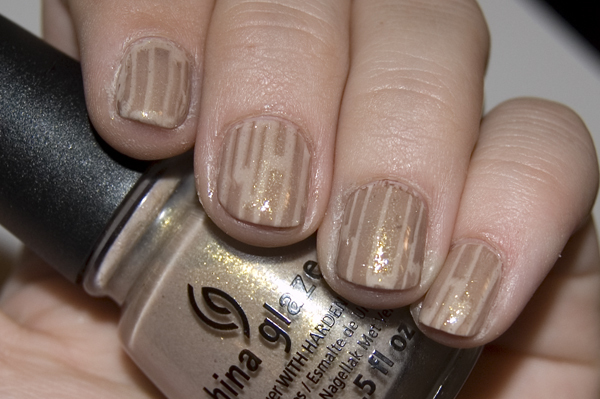 This pic looks great with the top on, but irl, you could hardly see the stamping depending on light. Drizzled! My first candy floss mani. There have been all kinds of pictures floating about with the "candy floss" technique. It's an interesting thing, messy, yet in a way, elegant. So I thought I would give it a shot. I didn't get many good pics of it...I don't know so much about my Zoya Purity for being the ideal white...It was very streaky, this pic masked that pretty well. Oh well! Anyway, a quick review on this technique: It's not my favorite. 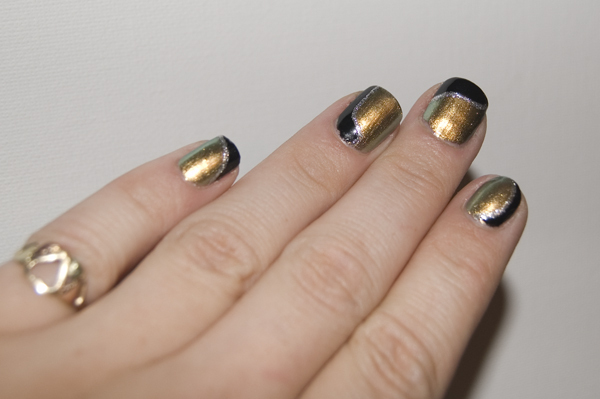 First, I wasted so much black polish to do this so it would be the right consistency to "string". Probably like 10 drops was wasted. Nono, that's nothing compared to a water marble, I know. However, the outcome of a WM is much more to be desired! It took a good few drizzles to get it to lay right, also. If I had to rate this technique and look, it would be a 6.5/10. It has so much potential to be awesome! It's a bold and daring look, yet can be acceptable for even job interviews(with the right color choices, of course!) I will be doing this again in the future, but I don't know when, I already have an idea of my next drizzled mani, but I've a few other things I want to try!! Also I got a little fed up with it after doing the accent nails. I did them first, just in case I didn't want to finish the rest of the nails. So glad I made that choice! I finally coated every nail in nothing but a glitter polish! This is big for me, really! 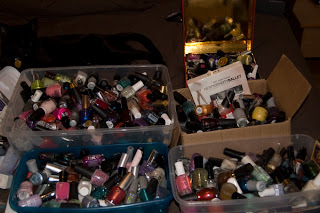 I usually hate glitter polish, because it's just too hard to get off! I rarely use a lot of it. Also I'm just a huge creme fan!! 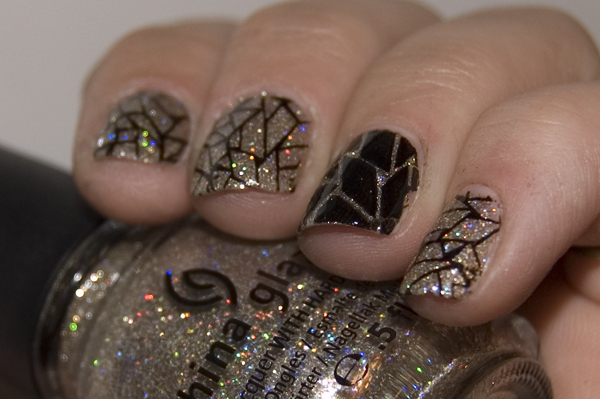 Here it is though, an entire glitter mani, bonus stamps! 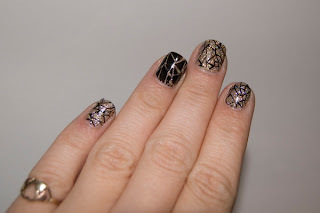 And Venique is amazing for stamping; It's totally my favorite to use for that! Question for you all: What do you is a good level of pic editing for blogs?? For the record, these pics were only edited for a tiny bit of brightness, but I have gone into more extensive editing before. For instance, what is okay? 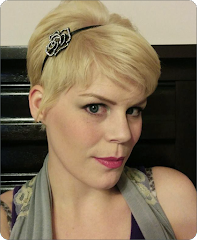 Shopping out small blemishes on the skin, mild cuticle cleanup, editing out fluff, fixing mistakes in the art itself, etc..
Let me know your thoughts, I want to know what you all think makes a 'true' blogger, or just a big phony! Hey everyone!! It's been a while and I've missed you!! 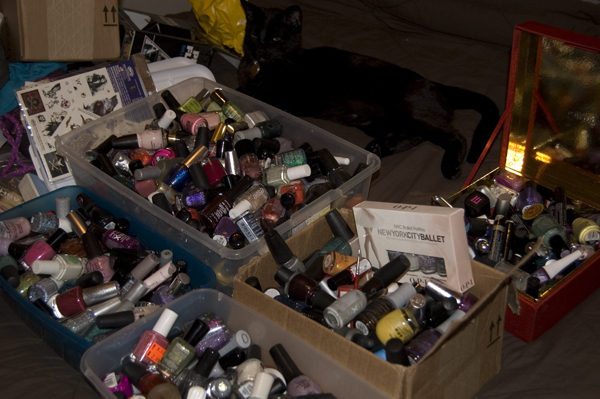 I'm all moved into my new place, and my polish is up on the racks! Well, what fits anyway. I used thumbtacks and pushpins myself. Anyway, I got my nails did today! By me, of course. I've been staring at them ever since like, "OMGAH this has been too long since I've had pretties!" OPI Just Spotted the Lizard and Zoya Raven, with by a cheapy Kiss glitter striper. This was freehand, and well overdue. During the move, with my polish all packed, I realized just how much I had. 4 small boxes full, and one pretty large box. It was so ridiculously heavy!! Also, if anyone has a new nail art/polish challenge, let me know! I'm really looking for something new and fun to do!